Today on homify 360 we have a look at a modern concept home, one that meets the need of every luxurious aspect to modern living. 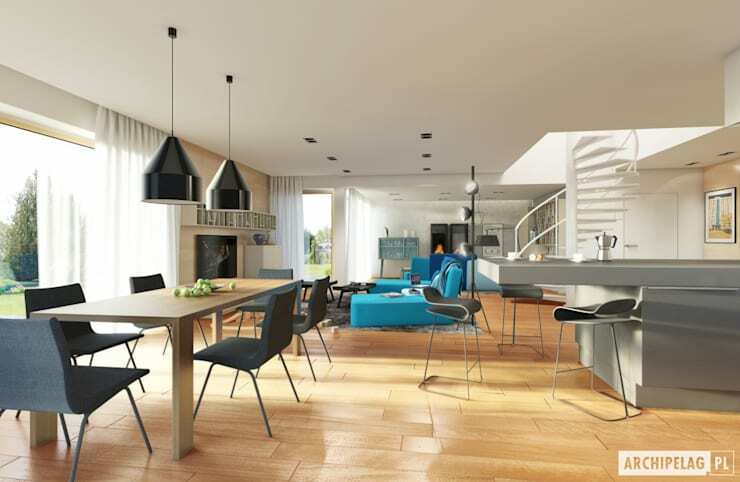 A home that is simple, elegant and above all celebrates comfort and sophistication. 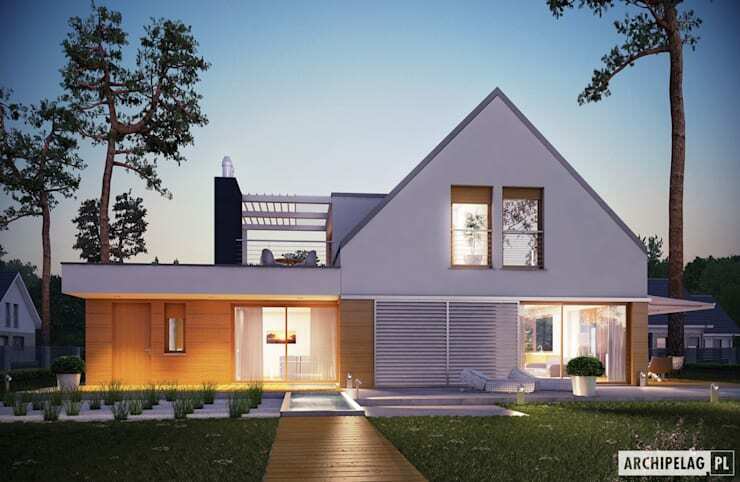 The architectural team at Pracownia Projektowa Archipelag have taken care of all these requirements perfectly, in the creation of this modern designer home. The chic and comfortable home will make a fantastic space for a growing family, it's a classic and modern dream home development that we just adore! Let's take a closer look at this marvellous home currently under construction. Our first look at this fascinating modern home takes us to what it looks like in the early evening. The fantastic lighting from the interior adds a magical illumination to this external view. It's clear from this perspective that the home boasts two storeys and has a stylish approach of clean geometric lines. This is a posterior view of the home and it's clear that outdoor space has not been forgotten in this beautiful home design. Continue reading for more from the interior of this wonderful modern home. The interior of this home is cosy and comfortable with an open plan approach to living. The living room, dining room and kitchen are all connected on the ground level of this home, making it a great for those social occasions. The large windows located throughout this open plan living space ensures that natural sunlight and ventilation create a comfortable and inviting interior throughout the day, while adding a family friendly sense of warmth that makes this home even more special. The decor is neutral and simple, aside from the striking blue sofa which adds just enough personal style to this home space. This image perfectly shows off the modern kitchen that is necessary in this chic modern family home. 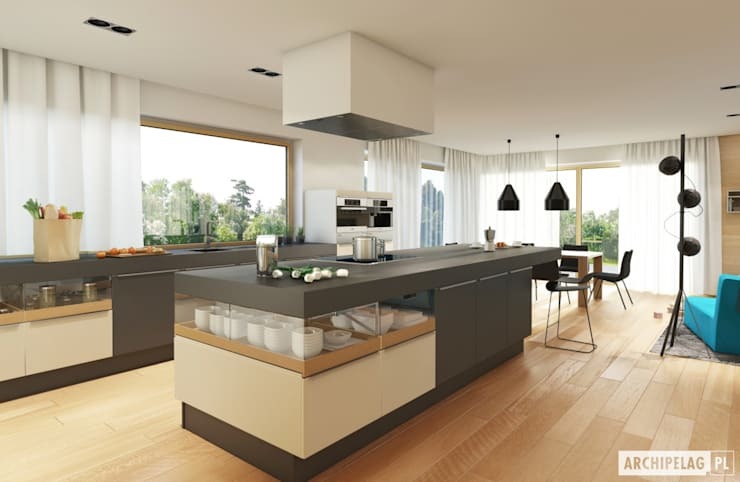 Although it is located in the open plan space, the kitchen has its own fascinating and sophisticated appeal. The modern appliances and centre cooking island ensure that you are never out of touch with your guests, and this means you can keep a watchful eye on the kids too. The wooden flooring and neutral tone of the kitchen cabinets ensures that this modern kitchen will remain trendy and appealing for years to come… you'll never be out of style. 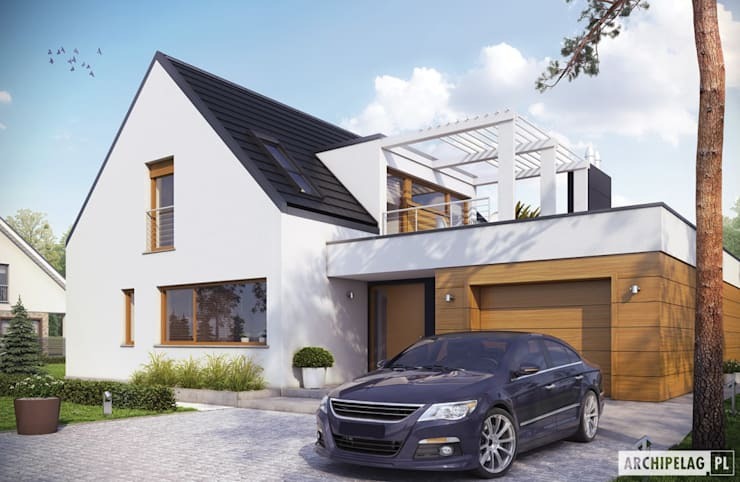 This is the main entrance to the home and includes pedestrian access as well as a built-in garage, which all modern homes ultimately enjoy. 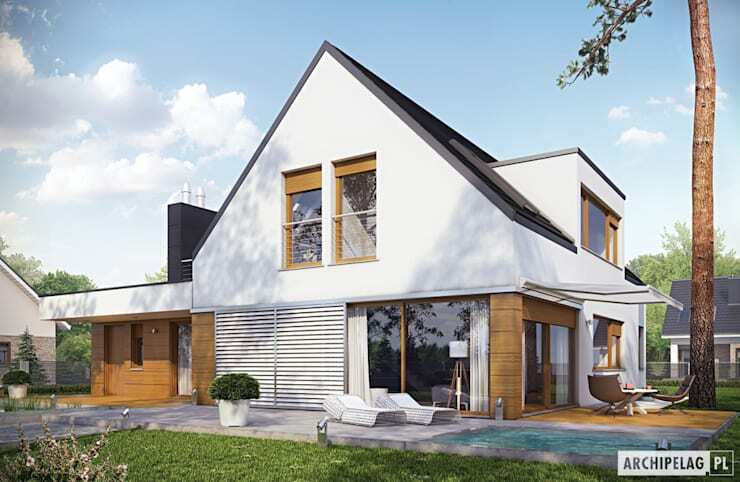 The exterior of this modern home is elegant and simple with a modern yet retro feeling. The large windows let the sunlight shine in from the street too, so you can check who decided to visit before opening the front door. Here we catch a glimpse of the amazing terrace located on the second floor… but more on that a bit later. This family home enjoys terrific space, stunning views, an abundance of natural sunlight as well as a great outdoor space with luscious green lawns for children to enjoy. Fancy a picnic? Well there's no excuse with this modern home… just grab a blanket and eat outside! The memories and family time that can be enjoyed in this magnificent modern home are unbelievable, but just wait until you see the terrace! This is a chic and sleek home inspiration that we just adore! The terrace view is up next… continue reading! 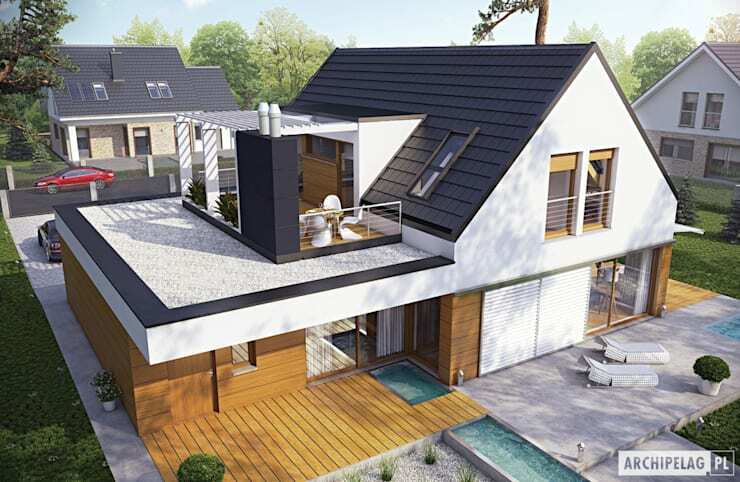 We end our Ideabook today on a high note with a top view of the fantastic modern home! This designer feature is filled with amazing secrets and the terrace is one of them. Enjoy your morning coffee and newspaper from this lofty view. We zoom in a little closer and see that a pergola was added for perfect shade throughout the year! This home has everything that signifies modern living at its best. Now how about planting your favourite flowers in that garden below or taking a dip in the swimming pool on a hot summer day? If you liked this home design feature by this architectural team, then have a look at: The Modern Cottage for Happy Families. Didn't you just love the terrace? Tell us what you think about it below!